Please, please become a more patriotic and proud nation. 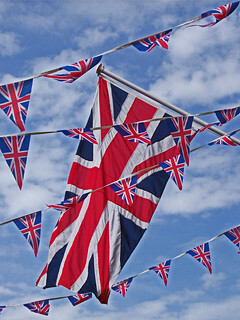 Britain has looked spectacular with the Union Jack being displayed in full everywhere and on everything during the jubilee weekend. There's nothing to be embaressed about. Take back your flag from the BNP and start showing it off. Put it on everything made in Britain and show the world how great Great Britain is. I know it's not very British, but I think it's time to drop the stiff upper lip and show off your worth. No one else is going to sing your praises, so do it yourself and do it well. Oh and whilst you're at it, a little respect for the flag would be nice: having Union Jack undies is really not the most patriotic of things, especially as you have to be almost neked for anyone to see how proudly British you are ;-) .